16th June, Macau: Yannaphon Larpapharat of Thailand successfully defended the Men's Open Masters title of the Macau China International Open 2012 while Chan Weng Sam captured the women's crown for Macau for the first time. Yannaphon, who was seeded No. 1 for the stepladder finals, needed the second match to beat challenger and No. 2 seed, Wu Siu Hong of Hong Kong, 263-175 to win the Men's title for the second consecutive time. The Thai had two splits and three opened frames in the first match to lose to Wu, 167-229 in the first match and was forced to go into the second deciding match. Yannaphon bounced back brilliantly to romp home a comfortable win over Wu, 263-175 to take a well-deserved victory. "I knew that it was going to be a tough match against Wu especially when he is very good on freash oil and I'm not that comfortable," said the 29-year-old Yannaphon, who won two titles in 2010. "When Wu took a hugh lead in the first match and I knew it would be difficult to catch up, I used the opportunity to experiment with different lines so that I can match him up in the second match. "The carry down helped a lot and I was able to deliver my ball to the pocket and get the carry," added the champion, who picked up the top prize of MOP70,000 (approx. US$9,000) for the win. Wu, who settled for for MOP30,000 (approx. US$3,800), had earlier edged third-seed, Tim Mack of USA and winner of the first match, Hareb Al Mansoori of UAE, 182-164-132 to advance to the title match. Hareb, who took home MOP15,000 (approx. US$1,930), defeated fifth-seed, Lin Pai-Feng of Chinese Taipei and fourth-seed, Wicky Yeung of Hong Kong, 209-197-137 in the first stepladder finals. Yannaphon topped the Round 2 finals with a 16-game total of 3460, 57 pins ahead of Wu in second with 3403 and a further 3 pins ahead of Mack in third with 3400. Yeung, Lin and Hareb made the cut in fourth to six positions. Meanwhile, national youth Chan Weng Sam did brilliantly to capture the Women's Open Masters title for her country for the first time since the inception of the Macau China Open in 2009. Chan only needed one match to beat challenger, Hong Hae-Ni of Korean National Sports University, 214-201 for her maiden international title. Both had clean games but it was Chan who rolled two double strikes to edge the Korean. "I was worried that I would face another spinner in the final and when it turned out to be the Korean, I was a bit relaxed," said the 18-year-old student who studies in Taipei. "I had a good start with a double strike in the first two frames and when I had the lucky second double in the ninth and tenth frame, I knew I had the title sealed," added Chan, whose major triumph was winning the 2011 Macau Cup and picking up a silver medal in 2009 Asian Intercity Championships. Hong, who was seeded No. 3, outclassed second-seed and Round 1 leader, Putty Armein of Indonesia and winner of the first match, Chan Shuk Han of Hong Kong, 241-182-166 to face the top seed. Chan won the first match after she beat fourth-seed, Ji Eun-Sol of Korean National Sports University and sixth-seed, Tang Joh Six of Malaysia, 237-212-209 to advance into the second stepladder match. The champion earned MOP40,000 (approx. US$5,100) for the win while Hong settled for MOP18,000 (approx. US$2,300). Armein, who finished third took home MOP10,000 with Shuk Han, Ji Eun-Sol and Joh Six picking up MOP4,000, MOP3,000 and MOP2,000 respectively. Three spinners and three hook-ball style players made the women's stepladder finals. Chan topped the earlier Round 2 finals with 3271 followed by Armein in second with 3260 and Hong third with 3237. More than 350 bowlers from 12 countries took part in the week-long Macau China International Open since June 10. The top 16 Asian men and top 16 Asian women qualified for tomorrow's ABF Tour Macau leg. Photos by Terence Yaw in Macau. 15th June, Macau: Putty Armein of Indonesia grabbed pole position in the final game of the Women's Open Masters Round 1 finals at the Macau China International Open 2012 from front-runner, Tang Joh Six of Malaysia. Jaya Ancol Bowl's Sharon Limansantoso set a blistering pace with a 239 opening game to led the field of 30 finalists with Malaysia's Tang Joh Six hot on her heels with 235 and Limansantoso's compatriot, Putty Armein in third with 233. A stronger 222 from Tang in the second put the Malaysian in the lead as Hong Kong's Chan Shuk Han homed in on the leader after a superb 246 to trail by 7 pins. Tang continued her strong pace with 203, 203, 213 and 197 for the next four games to maintain her lead and building up a decent gap of 38 pins from Chan in second while the two Indonesian women kept in close touch. Armein then fired a scintilating 266 in the seventh game to move up to third as Tang's lead was reduced to 9 pins when Hong Hae-Ni of Korean National Sports University took over second spot. Armein closed out the first round with another superb 226 to clinch pole position with 1648 as Tang hung on to second spot with 1624 ahead of Hong Kong's Milki Ng, who shot shot three big games in the last three games, to move into third with 1617. "I changed to a bowling ball that I wasn't using much and all of a sudden it carried well," said the 30-year-old 2009 ABF Tour Macau leg champion, Putty Armein. "I also made a little adjustments and ended with the two big games. I hope this ball will work tomorrow as well and hopefully I can make the top 6." Chan slipped down to fourth with 1616 while Hong dropped down to fifth with 1605. Limansantoso rounded up the top 6 with 1585. Macau's best was Chang Weng Sam, who at one stage was in the top 3 as spinners were setting the early pace. The women will resume with their second block tomorrow morning at 9.00am local time folowed by the men in the afternoon at 1.00pm. The top 6 advance to the stepladder shootout finals. 15th June, Macau: Kim Sang-Pil of KNSU took pole position of the Men's Open Masters Round 1 finals at the Macau China International Open 2012 ahead of defending champion, Yannaphon Larpapharat of Thailand in second and Wicky Yeung of Hong Kong third. Yannaphon got off the mark with a sizzling 255 in his opening game to lead Korean National Sports University's Kim Sang-Pil by 8 pins after the latter rolled an equally superb game of 247. A strong game of 257 from Jaya Ancol Bowl's Ryan Lalisang in the second game after a 235 in the first, took the Indonesian into the lead with a handful 42 pins margin over Tim MAck of USA moving up into second spot. Hong Kong's Rickle Kam, who shot a big game of 265 in the third, took over the running briefly and handed it to Kim at the halfway mark as Lalisang recovered from a poor 180 in the third to take up second. Kim led for the next two games before being overtaken by another Hong Kong national, Wicky Yeung, 12 pins ahead of Yannaphon and a further 4 pins ahead of Kim slipping down to third. But the Korean bounced back with 236 in his eighth and final game of the round to regain top spot with 1797, 12 pins ahead of Yannaphon, who retained second spot with 1785 followed by Yeung slipping down to third with 1768. "I felt very comfortable in the beginning but as the lanes got a bit tricky, I was not doing too good," said the 21-year-old Kim, who is also a member of the Korean national youth team. "It's good to finish in the lead but we've another 8 games tomorrow. 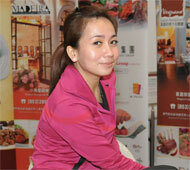 I've to work harder and hope to make the stepladder finals." 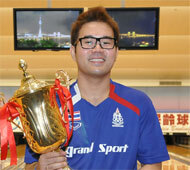 Lalisang clinched fourth spot with 1754 ahead of a second Hong Kong national bowler, Rickle Kam in fifth with 1712. A third Hong Kong national, Wu Siu Hong stormed home to finish in the top 6 with 1705. Tim Mack, who was amongst the top 6 before the last game, felled down to seventh after a lowly 174 while two Emiratis, Hareb Al Mansoori and Hussain Al Suwaidi finished eight and ninth. Macau's Lee Tak Man completed the top 10 with 1647. The men will resume with their second block tomorrow at 1.00pm local time after the women finish their second block starting in the morning. 14th June, Macau: Three-time Asia Ranked No. 1, Hussain Al Suwaidi of UAE showed a return to form as he stormed into the lead of the Men's Open Masters qualifying leaderboard at the Macau China International Open on Thursday. Hussain, who showed a glimsp of his form after finishing as first runner-up at the Hong Kong Open last week, motched up an improved 709 series for a new 6-game aggregate of 1397 for the lead. The 30-year-old had 688 and 644 on a previous total of 1332 and was in seventh position in the overseas pool. Hussain, who has three open titles, three ABF Tour leg titles including a winner in the ABF Tour TOC in 2010, is a strong title contender for the men's crown. Tim Mack of USA also moved up the leaderboard with an improved 1382 total to take up second spot pushing down overnight leader, Choi Kyung-Hwan of Korean National Sports University into third position on 1367. Hong Hong Open third runner-up, Lee Tak Man will lead Macau's fight to the men's title as the top local seeded qualifier and has registered an impressive 1460 total in the process. Several bowlers made headway as well including ex-national and Thailand Open champion, Surasak Manuwong of Thailand finishing fifth. The current cut is held by Kuwait's Basel Al Anzi with a total of 1269. There were no changes in the Women's Open division with Ji Enu-Sol of Korean National Sports University firmly in the lead with 1324 followed by two Indonesians, Putty Armein and Sharon Limansantoso in second and third with 1295 and 1271 respectively. Last year's ABF Tour Macau leg winner, Julia Lam will lead Macau's challenge for the women's title as the top local seeded qualifier with Filomena Choi and youth, Hui Tong in second and third. Ex-national, Chan Weng Sam topped the local pool table with a superb 1336 and can be a title contender too. Qualifying will end late tonight and the top 40 men and top 30 women will contest the Masters finals over two blocks of 8 games each on June 15 and 16. The top 6 mwn and top 6 women will advance to the stepladder shootout finals. 13th June, Macau: World Youth bound, Zoe Dias Ma of Macau cruised to an easy victory in the Youth Open Masters finals of the Macau China International Open 2012, 109 pins ahead of his nearest opponent. Oscar Chan of Hong Kong got off to a good start in his first two games to lead Macau national bowler, Zoe Dias Ma by 6 pins and another Macau youth, Pun Ngou Teng a further 23 pins away in third. But it was the consistent lines of 202, 200 and 222 from Dias Ma in his first three games that shot the Macau youngster into the lead and opening up a gap of 65 pins over compatriot, Au Kuong Un in second. Despite a 163 in the fourth which allowed Hong Kong's Leung Hon Man to narrow the gap to 28 pins, Dias Ma went on to roll 189, 222, 188 and 224 to end the 8-games finals with 1610, 109 pins ahead. "I knew I had a strong chance of winning but still I had to put in 110% effort and focus," said the 20-year-old Dias Ma, who is a member of the 4-men team bound for the World Youth Championships in Bangkok end of the month. "This win will give me the confidence to do well and I really hope that I can come home with at least a medal." Leung, who had dropped out of contention, bounced back with a strong 248 in his final game to clinch second spot with 1501. Pun, who was second before the last game, dropped to third with 1498 after a poor 157. 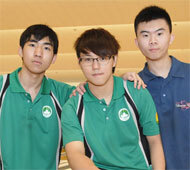 Hong Kong Open Under-18 and Youth Open doube winner, Lam Iek Long missed the podium to finish fourth with 1444. Meanwhile, championship debutant Paul Thein Fook Choi of Malaysia, snatched the Senior Masters title with 1202 over 6 games. 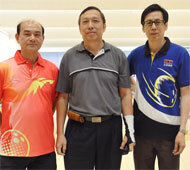 The 60-year-old Sabahan rolled 203 in his final game to edge pace-setter, Vong Vang Ip of Macau by 12 pins. Vong totaled 1190 to settle for second while ex-national, Eric Lau of Hong Kong claimed third spot with 1186 ahead of two Hong Kong veterans, Raymond Leung and Frankie Cheung completing the top 5. 13th June, Macau: Choi Kyung-Hwan of Korean National Sports University snatched pole position in the Men's Open Masters overseas pool as the Macau-China International Open reached its penultimate qualifying rounds on Wednesday. Choi notched up an improved series of 705 for a new 6-game tally of 1367 to edge overnight leader, Mohammed Al Jahromi of Bahrain by 4 pins. The 21-year-old was eighth in the overseas pool before improving his lower series of 600 to add to his other best series of 662. Jahromi settled for second with 1363 as Bahrain coach, Tim Mack of USA leapfrog into third spot with a superb 1348 total. ABF Tour Thailand leg champion and second runner-up at last week's Hong Kong leg, Wu Siu Hong took fourth spot with 1344. 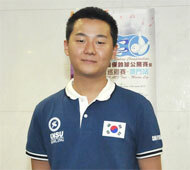 Early leader, Kim Sang-Pil of Korean National Sports University completed the top 5 with 1335. Macau top national bowler and third runner-up at the recent Hong Kong Open, Lee Tak Man headed the local seeded qualifier by a hugh margin. The southpaw registered 747 and 713 series for a 1460 total. The current cut at 19th position in the mixed pool stood at 1228 or an average of 204.67. This mark could well increase to as much as 1250 by the end of tomorrow's final day of qualifying. Indonesian women made an impression with Putty Armein cracked a 700 series with 708 to surge into second spot of the Women's Open Masters overseas pool with 1295 behind Ji Eun-Sol of Korean National Sports University in the lead with 1324. Putty's compatriot, Sharon Limansantoso chalked up a 6-game total of 1238 to finish third pushing down Hong Kong's Chan Shuk Han and Malaysia's Tang Joh Six into fourth and fifth positions on 1231 and 1217 respectively. Last year's ABF Tour Macau women champion, Julia Lam headed the local seed qualifier with 1240 followed by Filomena Choi in second with 1153 and Hui Tong third with 1061. The women's division is populated by students from Korean National Sports University taking up 10 slots of the qualifying table. The Men's Open and Women's Open will contest two blocks of 8 games each on June 15 and 16. The top 6 men and top 6 women will advance to the stepladder finals shootout to determine the champion. 12th June, Macau: Bowlers from the Korean National Sports University stamped their mark at the Macau-China International Open 2012 underway at the Internacional de COTAI Bowling Center with Ji Eun-Sol topping the Women's Open Masters qualifying table. Ji, who won a silver medal at last year's Asian School Championships in Bangkok, shot into the lead of the Women's Open Masters standings after she registered the first 700 series with 711 for a 6-game tally of 1324. Hong Hae-Ni and Kim Ji-Yeon, who were second and third last night, were overtaken by ABF Tour Hong Kong leg semi-finalist, Chan Shuk Han after the Hong Kong national bowler moved up into second spot with 1231. Hong settled for third with 1182 while ABF Tour TOC winner, Tang Joh Six also improved to split up the Koreans to take up fourth position with 1175 ahead of Kim in fifth spot with 1170. 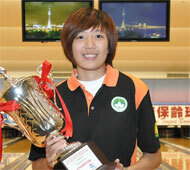 Last year's ABF Tour Macau women champion, Julia Lam heads the three spots reserved for Macau national team with 1196. Filimena Choi and Hui Tong occupied second and third spots. 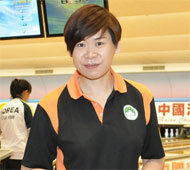 Chan Weng Sam was the highest scorer in the women's division with 1336 and is placed fourth. Meanwhile, Kim Sang-Pil of Korean National Sports University had topped the Men's Open division yesterday but was pipped by Mohammed Al Jahromi after the Bahraini registered 687 and 676 for a 6-game tally of 1363. Kim dropped to second with 1335 followed by last week's Hong Kong Open first runner-up, Hussain Al Suwaidi of UAE in third with 1332. 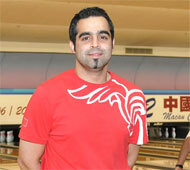 His compatriot, Sayed Al Hashemi finished fourth with 1302 while Parvez Ahmed rounded the top 5 with 1285. Top national bowler and last week's Hong Kong Open stepladder finalist, Lee Tak Man heads the four spots reserved for the Macau national team with an amazing 1460 total with 747 and 713 series. Ho Weng Hou, Choi Io Fai and Lei Ka Hou took up the three remaining local seeded qualifiers in second to fourth positions. The top 10 local men qualifiers, top 11 men qualifiers from the overseas pool and top 19 men qualifiers from the mixed pool making up 40 finalists will contest two blocks of 8 games Masters finals on June 15 and 16. The top 6 will advance to the stepladder shootout finals. The top 7 local women qualifiers, top 9 women qualifiers from the overseas pool and top 14 women qualifiers from the mixed pool making up 30 finalists will contest two blocks of 8 games Masters finals on June 15 and 16. The top 6 will advance to the stepladder shootout finals. The top 16 Asian men and top 16 Asian women will also qualify for the ABF Tour Macau leg which will be held at the same bowling center on June 17.